Of course, a new upgrade to Python on my devbox and the virtualenv breaks. And, merely reinstalling the virtualenv over top doesn’t work. This is where you need to make sure your python project has an adequate setup.py to install the dependencies or you’re going to end up reinstalling by hand. Then, rerun setup.py with either install or develop and you should be set. If it doesn’t work, a few things might need to be checked. First, you need to make sure your virtualenv is using Python 2.7.
which will give you some output at which point you should be able to determine the issue. One of the biggest problems I had with the old control panel was that certain functions really weren’t well thought out, so, using the control panel was quite cumbersome. Some of the earlier redesigns of the Task Status Report made a large impact. Making the report easy to read and to convey the critical information very quickly was one of the goals. The primary goal was to make sure that it was as easy to use the Control Panel to do things as it was to start an ssh session and do things manually. But, we needed to make the form easy enough for people to use that didn’t know what they needed. Easy enough for everyone, still quick enough for someone that knows precisely what they want. The following two screenshots are from the old Control Panel. Arguably one could say that the Simple interface was harder to use than the Advanced interface. 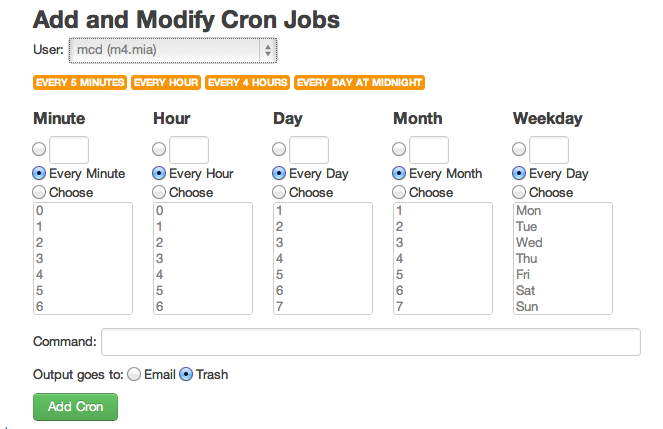 With a few buttons to allow very commonly entered options to be selected, adding a cron job becomes quite easy. 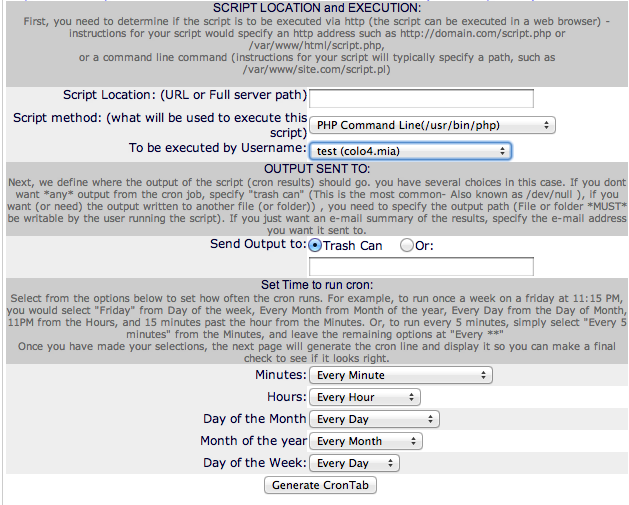 I have debated whether to add a single line entry that just takes the raw crontab entry so that people don’t need to parse it and fill in the form. Sometimes, forms can be usable.